Coverage:Watch live on BBC TV, HD, Red Button, Connected TV, online, tablets, mobiles and BBC Sport app. Northern Ireland's Joe Swail lost 10-5 to Matthew Stevens of Wales in the final qualifying round for this year's World Championship in Sheffield. Stevens, twice a world finalist, led the Belfast man 5-4 overnight. The 11th frame of the match came down to the final black but Swail fouled on the cue ball to hand his opponent a crucial 7-4 advantage. The Welshman won the next two frames, Swail won the 14th, but Stevens ensured his passage by taking frame 15. Swail lost the opening two frames of the match on Wednesday, then drew level at 4-4, before losing the final frame of the session. The double world semi-finalist had moved within one victory of reaching the last-32 televised stages by beating Dominic Dale 10-9 in the second qualifying round. Stevens, a runner-up in 2000 and 2005, beat Peter Lines 10-7 at Ponds Forge Centre to progress to his meeting with Swail. Stevens now goes into Thursday's main draw at the Crucible, where the top 16 players in the world, including Antrim's Mark Allen, will be paired with 16 qualifiers. 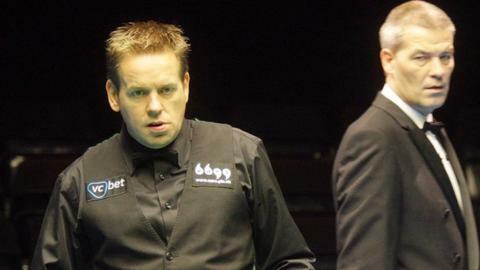 Former world champion Ken Doherty lost 10-3 to Mark Davis in his final qualifying round game.